The Cashmaster Sigma 170 is a fast and accurate count-by-weight cash counting machine specifically designed to allow your business to save time, money and improve accountability. 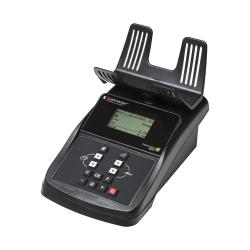 Designed for single till use, the Cashmaster Sigma 170 will assist any business that handles cash. It is an invaluable and easy-to-use device that not only counts cash quickly, but also allows you to prepare floats, prepare banking and conduct instant checks and audits in a fraction of the time. An integrated printer can be attached within the same footprint, to provide an accurate reading of your till. Our weight-based cash counting products help your business work more efficiently and are proven to prevent cash loss or shrinkage. Counting by weight is considerably faster and easier than counting by hand and highly accurate. Additionally, our products can count notes, coins and vouchers and instantly reconcile takings allowing you to conduct on-the-spot audit checks. PSG understands that after sales support is where long-term customers are won (and lost). That is why PSG focuses on providing a low total Cost of Ownership package. We do this by not only offering tremendous value based on the purchase price, but we also keep your on-going cost extremely low. Included in the base price of the Cashmaster is a three - year warranty thereby eliminating very costly maintenance charges. A toll free Help Line is available 8 a.m. to 8 p.m eastern standard time. Our National Service Center is located in Orlando, Florida allowing us to cover the entire country very efficiently. Over 25 years experience… Profit Solutions Group has been able to establish a leading role in assisting businesses across the nation to drive down costs and achieve cost effective ROIs. Profit Solutions Group includes a team of experienced business professionals with over 25 years of diverse retail experience. The PSG Partners have successfully helped many of the most prestigious National / International companies in the world, including McDonald’s, Tractor Supply, CST Brands, Valero, Skechers, Chick fil A, In and Out Burger, etc.